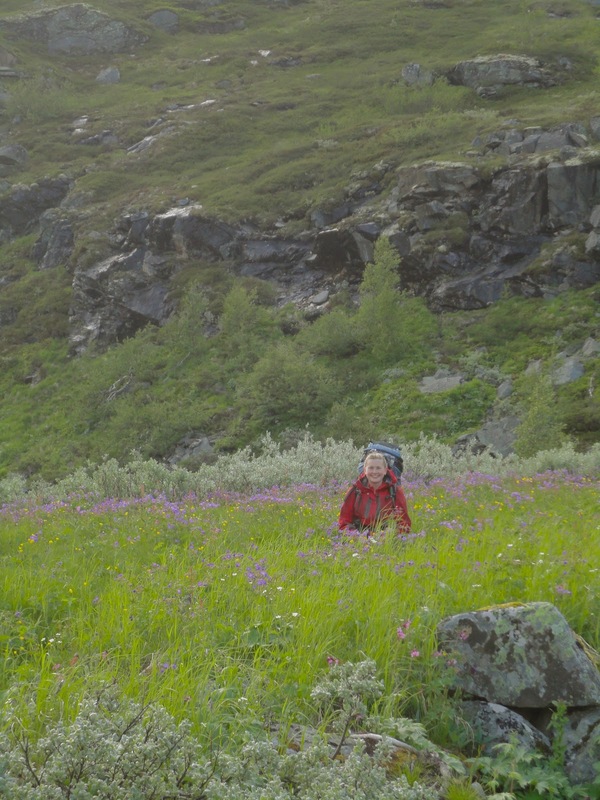 The hike from Spiterstulen to Turtagrø started predictably late. I shouldered my large backpack, thinking "This isn't so bad". The pack looked enormous, towering above my head, but it wasn't nearly as heavy as it looked. The weather even looked nice. Today's hike would surely be long, but at least it was only through a couple of valleys, with no significant climbs. 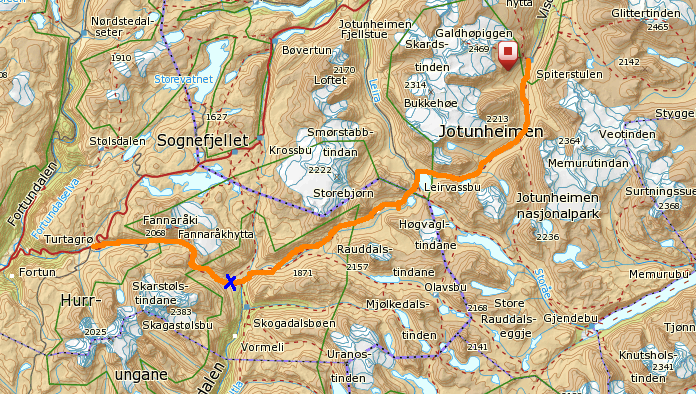 A hop, skip and a jump, and we would be at Turtagrø by midday tomorrow. 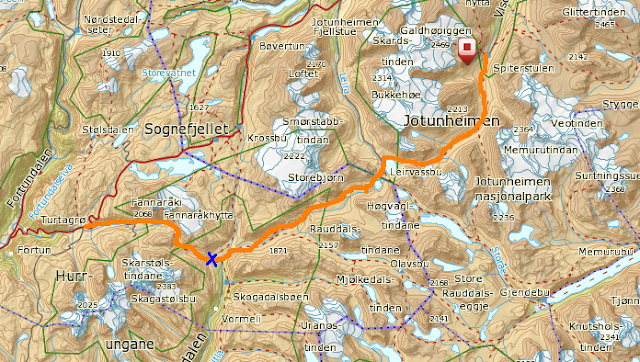 The hike from Spiterstulen to Turtragrø is drawn on the map in orange. The blue cross is where we camped out. After a few kilometers, I realized it wouldn't be nearly that easy. When carrying a backpack, you kind of have to forget it's there. You obvious can't move in the same way as you would without a backpack, but your muscles come to peace with the load and you can think about other things. The thing is, my big backpack doesn't fit very well. Usually, I only carry things for short distances in this pack - I don't do a lot of pure backpacking. This time I finally realized I've had enough of my Dana Designs Sun Ribbon. The hip belt is really bulky and overpadded, so much so that it rubs and gave me blisters, the whole backboard is really flat and doesn't fit well against my back at all. The result of this is that it hangs really heavily on either your shoulders or your hips instead of distributing the weight more evenly. It's also way too skinny, so it becomes this giant tower when you fill it with stuff. By the time we reached Leivassbu, less than halfway, but with only downhill ahead of us for the day, I was fed up. There was about 10 times as much snow over the last kilometers then there was in July two years ago, making going slow and laborious. We sat down and boiled some water for cup-a-soups, and I contemplated bailing, hitchhiking out to Lom, spending the rest of the day warm in the bakery eating pastries. But in the end, obstinacy and idiocy won. I put on the hated backpack again, and stomp away from Leirvassbu. We headed out of Leirvassbu on a snow-covered dirt road, discussing how much skiing could still be done in all this snow. I started to forget my pack, and as the trail headed down into the valley of Gravdalen, I thought that this might actually be paradise. When compared with the area around Spiterstulen, this really seemed off the beaten track. We didn't see anyone. Every bend in the river gave a new view of the dramatic Raudalstindene mountains, or we spotted a great swimming hole, or meadows of vibrant, purple flowers. We stopped for dinner along the trail, and I fell asleep in the sun while the Man Unit cooked. What a wonderful feeling! After dinner, the extra calories and long break rejuvenated our legs and turn into good conversation. Eventually it started to get late, and I went in to endurance mode. I basic shut up, put my head down, and, according to the Man Unit, started hiking faster than I had all day. I was tired, I wanted to lie in my sleeping bag, and all I could think was "just cross the big bridge and you can pick a tent site." We crossed the bridge at about 10 pm, and found a tent site a little ways up the hill. The next morning we headed out early, as the Man Unit had to make a bus to Oslo at 3 pm and we wanted to make sure to have plenty of time. The trail took us steadily and slowly upward to Keisarpasset, a pass at 1500 meters. I was running on chocolate and fumes, but upon arriving at the top of the pass, I actually thought, "That was easy!" We cross through a winding valley and heading steeply down to Turtagrø. It was at this point that the Man Unit informed me that his boots were putting a lot of pressure on his ankle. He spent the rest of the hike in a lot of pain. It was funny how our roles were reversed. I coaxed him along, talking nonsense and singing and trying to distract him. But his feet hurt and he just wanted to get there! Finally we did. I sent him off on the bus, and my dad showed up from a hike later that day. I was able to relax all afternoon, but I was realizing that pushing myself through the hike like I just did was probably not the best preparation for the long journey up the third highest mountain in Norway. Act 2: Storen - the big one! We met with our guide, Andreas, before dinner. He informed us that breakfast was at 4 am, and that we would depart shortly after that. I have never done a true alpine start, and found this rather intimidating. But I got my gear together, had dinner and went to sleep soon after that. I woke up about once an hour all night, sure that I had over slept. The morning was quiet and foggy. I hadn't seen the mountain I was attempting to climb since I was a Turtagrø last, two years ago. 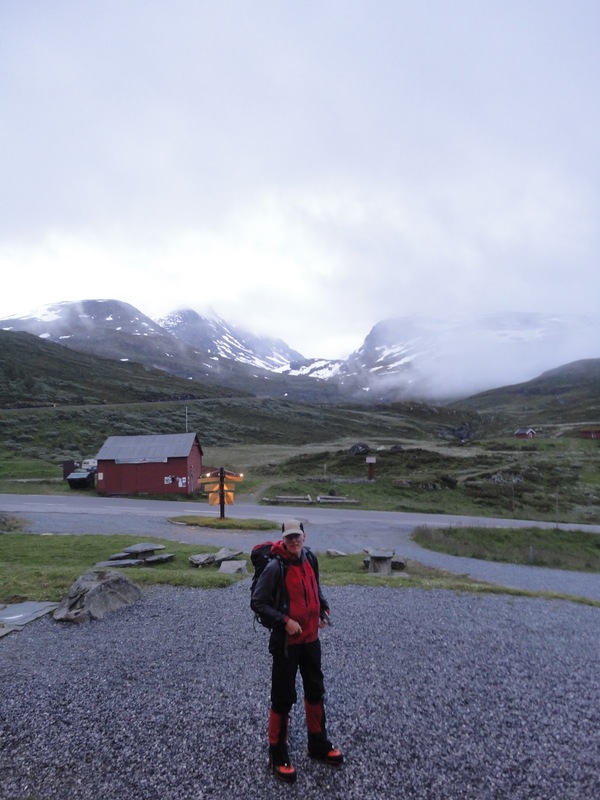 Dad at about 4:30 am, outside of Turtagrø. Store Skagastølstind is shrouded in clouds in the upper left of the picture. For the first couple hours, almost no one talked. It was simply so early that one was forced into a silent, meditative state. 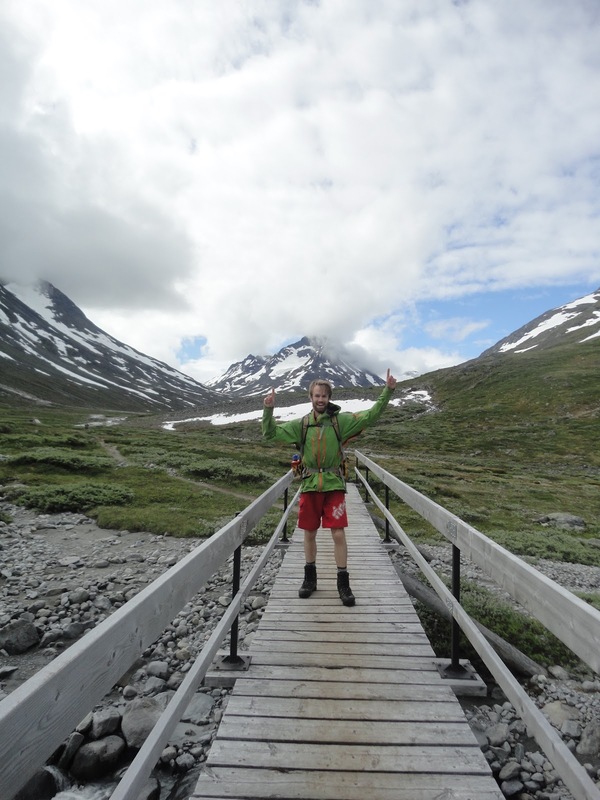 We arrived at the Skagastølbu at 7 am and ate second breakfast (as Pippin would say), and pulled on our harnesses and crampons. 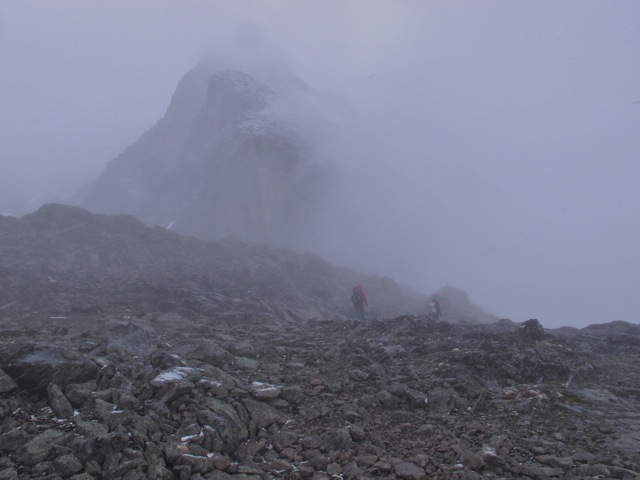 The topped loomed above us like a sleepy frost giant, powered in snow and hiding in the mist. It looked steep. 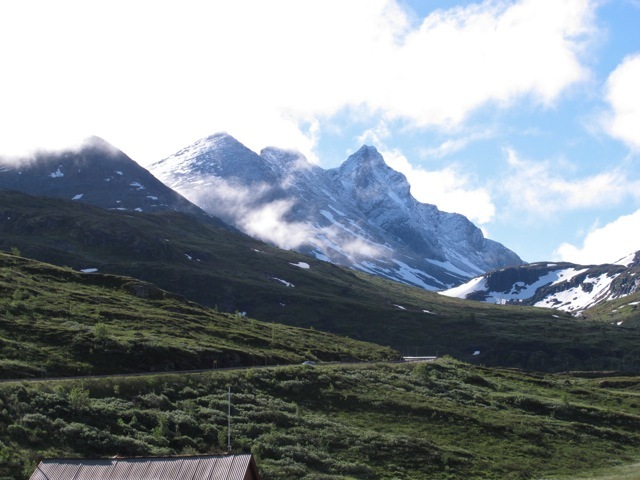 From the hut, we climbed up steep snowfields and I lost all sense of time passing. I learned the basics of using an ice ax for balance and self - arrest, and put all my mentally energy into what I thought of as the Ice Ax Waltz: one, move foot, two, move other foot, three, move ice ax. One, two, three, one, two, three. Slower than any waltz I've ever heard, steady, and careful. Don't slip. It's steep, you can't quite see what will happen if you slide, but you don't want to know. Finally at the top of the slope, panting. Steep rocks ahead. Anticipation. It was snowing. The night before our Andreas said that the worst possible weather was rain and wind, as this really gets you cold. So snow and almost no wind was good, but Andreas thought it could get windier as we got higher. We reached the first rocks that required roping up. Our steady guide headed up first and set up a belay far above us. I then followed - and felt absolutely ridiculous. 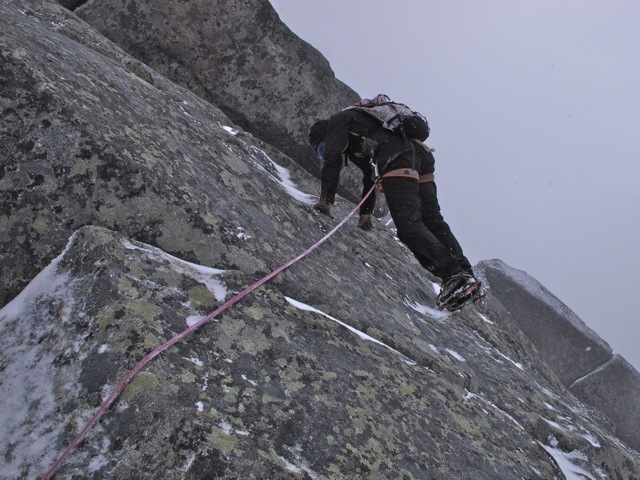 This wasn't climbing, it was scrambling up steep, wet rocks wearing crampons. I wiggled on my belly. 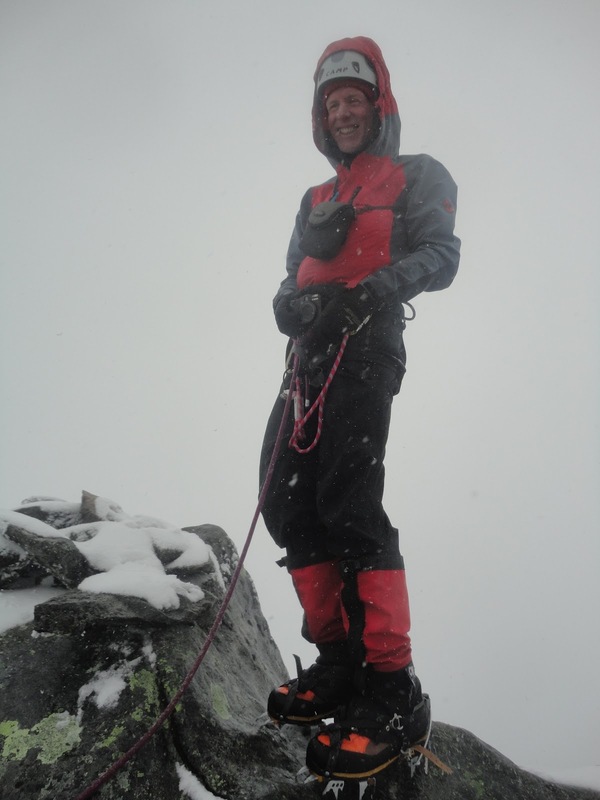 My crampons got in the way, nicking small holes in my rain pants. "Oh well," I thought, "The rain pants are due to be replaced anyway." It was at this point I realized this was not fun. I felt about 15 years younger as I told my dad this. "Do you want to turn? 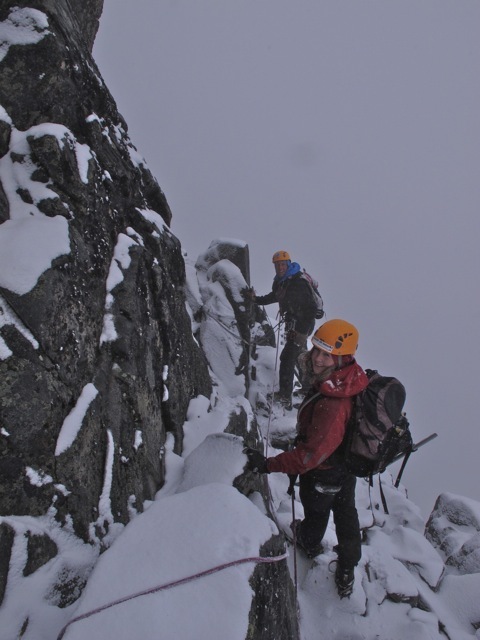 ", he asked, "The weather is pretty bad, but we have payed for a guide..." I kind of did want to turn. But I decided to do one more rope length, as I didn't have a good reason to turn immediately. Two rope lengths later the whole experience reached a turning point. "This is kind of fun," I told Dad as I shimmied up a crack between two wet rocks, barely avoiding ripping yet another hole in my rain pants. I was still scared of the actual climbing part, and decided that if it was windy when we got there, I would ask to turn. Hjørnet - in no wind! 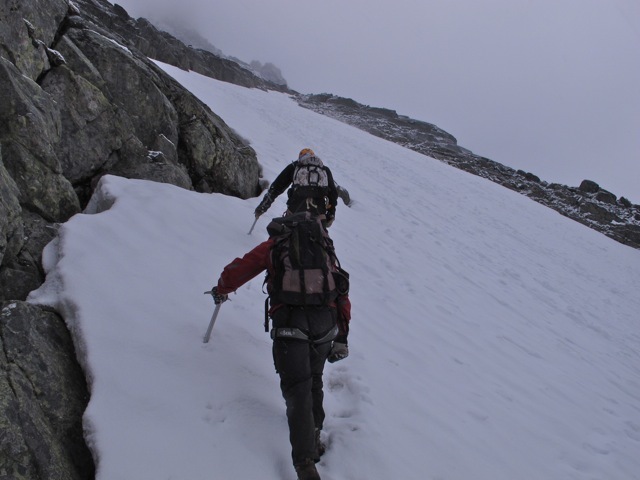 Miraculously, we rounded "Hjørnet" (the corner), the place where Andreas was sure the wind would start blowing, and heard the Sound of Silence - there was no wind! I was overjoyed, and when Andreas told us that this was the 'Point of no return', I knew we could do it. 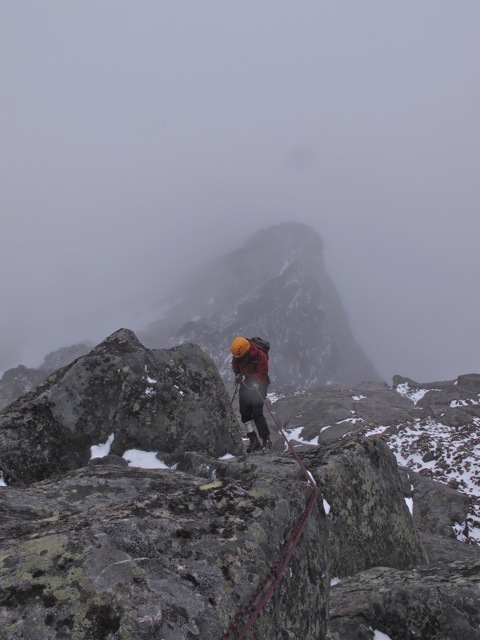 Andreas headed up in to the mist to lay protection, and I ate a few cookies and waited. Finally we felt the rope go taut, and it was time. Andreas shows us how it's done. The climbing was the funnest part of all, although technically quite simply. Climbing with crampons and a backpack is completely different from sports climbing with colored hand holds, indoors in the heat. You have to just do it, even if it's wet and snowing and taking off your gloves to feel the hand holds makes your hands cold. All of a sudden we were on top. Couldn't see a damn thing, but we were on top. On the way down, the elation of achieving the goal of day ran smack into the realization that I was tired. Dead tired. I remember vaguely that I had heard that most climbing accidents occur on the way down the mountain, and I understood why. The sharp focus - get to the top! - I experienced on the way up turned into to a dull ache to reach the bottom, to sit down, and eat. We rappelled off the summit, and headed slowly down the slippery rock slopes below the climb. In conversation with Andreas he mentioned that if anyone sprained an ankle, it would take us 24 hours to get down. Because no helicopters fly in this weather. Suddenly, I felt my crampons catch in my pants. I stumbled, and hurtled forward. The only thing I could think was that I needed to dig my crampons in and STOP! I did a full roll, but then twisted onto my stomach and dug it, stopping fairly quickly. Then I realized I was scared, and careless, let out a sob. We assessed the damage. My rains pants were completely beyond repair, but I had only scraped my shins, and I could walk right away. I was lucky, and fear brought my focus back. Down the steep snow slopes I slide several times but was able to stop quickly. Finally we reached the hut, and the most dangerous part was over. 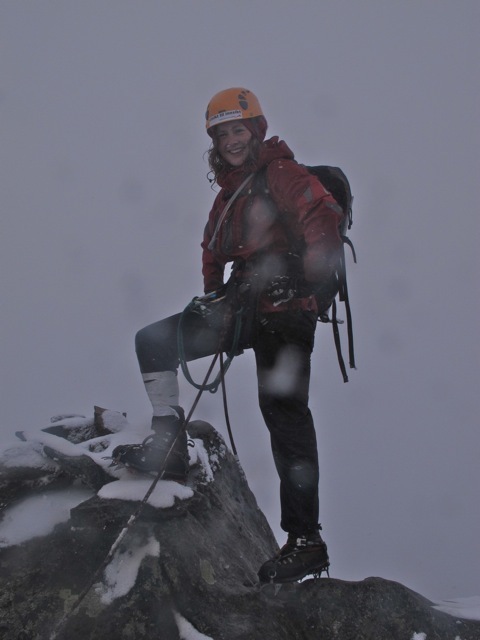 We took off our crampons (or knives, as I was now thinking of them), and I felt nimble and light all of a sudden. The two hour hike back passed quickly, discussing other hikes and skis we had been on. As I saw Turtagrø, I realized how hungry I was and how little I had eaten that day. A few sandwiches and some cookies. Nearly 13 hours after leaving, we arrived back, happy with our efforts and ready for food. The next morning, Stor Skagastølstind showed itself, as if waving good bye. My father got a beautiful parting shot. Stor Skagastølstind waves good bye. I arrived back in Oslo tired, but doubly happy.